Warm hospitality and delicious breakfasts. Edzell Golf Club is just a chip and a putt away. Kinnaber is a detached house built in 1923 in the beautiful village of Edzell. en-suite, the Green having a spa bath. Guests are welcome to use the garden and summer-house. 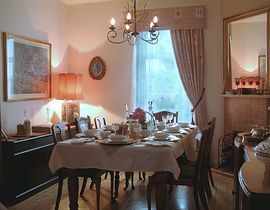 Although we do not offer evening meals there are several eating establishments in Edzell and area. Edzell is ideally located for those who enjoy outdoor pursuits - walking, cycling, fishing and golf. Montrose and the The North Sea coast is about 12 miles away and so Edzell is also ideal for excursions to the numerous coastal fishing villages. It is also well situated for those who are historically minded as there are several interesting places to view. Another Memorial in Edzell is the Inglis Memorial Hall and Library. Opened in 1898 it was commissioned by Colonel Robert Inglis in Memory of his father who was Parish Miniaster at Lochlee before moving to Edzell in 1841to continue as Minster for Edzell Free Church. The Hall has remarkable stained glass windows and the library is considered to be one of the best preserved examples of a late 19th Century public libraries surviving anywhere in the UK. Just off the B966 road is Edzell Castle, which is very often overlooked by tourists; now maintained by Historic Scotland the gardens are the highlight of the Castle, which were developed by Sir David Lindsay in 1604. Edzell lies at the foot of the Cairngorm National Park and is the gateway to Glen Esk and Glen Lethnot. Glen Esk is about 15 miles long and can be found off the B966 Edzell/Fettercairn road; it is not a through road and this has probably helped protect its unspoilt character. Glen Lethnot is sparsely populated and is the least known of the Angus Glens. Similar to Glen Esk it is a long glen with no through road. 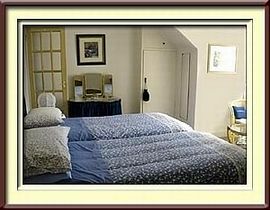 Twin Room (double occupancy) - one night: - £35.00 per person. 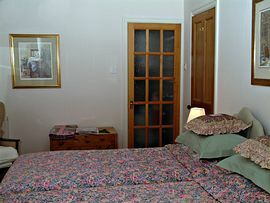 Twin Room (double occupancy) - 2 or more nights: £30.00 per person per night. 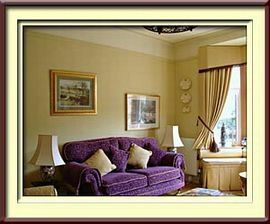 Single occupancy - one night: - £45.00. 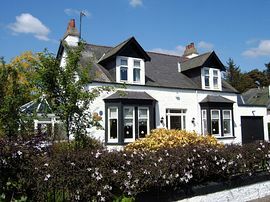 Single occupancy - 2 or more nights: - £40.00. Ramsay Street is first on the right, by the clock tower. Kinnaber is the first house on the left. halfway down the street, beyond the Bowling Green.